I remember my life at the Riviera from a very young age. Hard to believe, but my first memory took place when I was still in a crib. I remember that a bat flew through the window in my apartment to come and play with me—or so I thought. I was full of joy until chaos erupted. I remember a tall man in a green outfit using a long pole to push the bat out of the window. In reality, as I learned from my mother in later years, the bat hit the wall and fell into my crib, dazed and confused. My mother panicked and called a handyman to the apartment. He came to the rescue with a pole thats used for screwing in light bulbs. He then pushed the still unconscious bat out of the window. 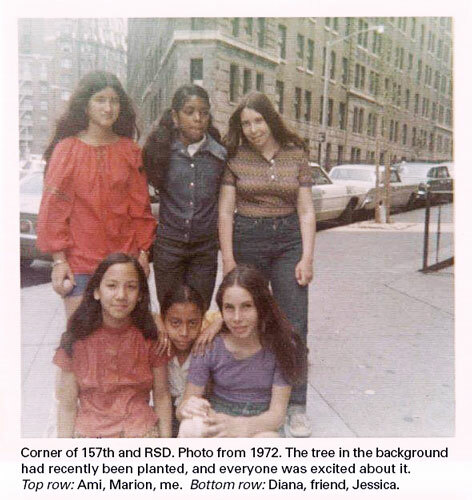 We became residents of 790 in 1977; we had lived in the Washington Heights Community since 1971 but had a new addition to our family, our son Shawn. Our relatively small, one bedroom apartment was no longer sufficient. After looking at apartments from Brooklyn to Westchester, I was introduced to the super "Frank" of the 790 Riviera Building, he was working on a recently vacated apartment, 7E , the previous occupants were the Hollingsworth family, he was an editor of Ebony magazine who had relocated to the West Coast. The apartment was freshly painted with light streaming through the windows; we had found our new home! The building was unique, 24 hour uniformed doormen and an elevator operator who asked you the floor you were going to and punched the button for you, we left our bagged refuse outside the door at night and it was collected for you before the next morning, stairs and halls were swept and mopped on a daily basis. One memorable resident Jesse Newman, who had lived here for decades, showed us an original blue print of 790 when it had less than ten apartments on each floor. Mr. Newman was just one of a host of famous and “different” occupants of the building; Mr. and Mrs. Wells of the famous “Wells Chicken & Waffles” of Harlem. Rose Robinson and her brother Major from 7G. Mr. and Mrs. Perry Huang & family who are our Chinese neighbors that were here over a decade before us and who still live there now. Who can forget the “Outlaw famil” of 4G who left a powerful impression on all who knew them, Thad and Jerry the couple from 7D, Roger Furman, an actor and director of New York's black New Heritage Repertory Theater, and the list goes on and on. I have to mention our doormen, particularly Kenny and Hilton who were excellent and had a sense of ownership and protection toward the building and its residents. Our super was named Frank; he knew the building inside out and could fix any problem that you had “if you could catch him”. I could write for days about this wonderful building, the great times watching the 4th of July Fireworks from the roof. We have seen the ups and downs of 790 Riviera, we think we are seeing an effort to restore the former ambiance, we hope that the former attitude of family will come with it. I live in New Jersey now, but often drive up Riverside Drive on the way to the GW Bridge, and see the Riviera and the Grinnell, which bring back memories of my growing up. My family (my brother is now 98) moved to the Riviera in 1922. I was five years old, and we had lived in the Grinnell for two years. To me, the Riviera was an elegant building, with two entrances, one on the corner of 157th street and Riverside Drive, and the other on the corner of 156 Street and Riverside Drive. The lobby seemed enormous, and I seem to remember a staircase, perhaps marble, where I fell and broke my nose. The apartment was on the 10th floor, looking out on the Hudson River. There were three or four bedrooms, a maid's room and bath, kitchen, dining room, living room, and music room. There was no viaduct on Riverside Drive, and we could walk right down to the river. I had the measles when I was about eight years old, have a photograph of me sitting on my bed looking out at the Hudson. 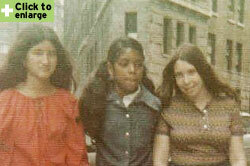 I went to PS 46 elementary school on St, Nicholas Ave, and one Halloween, as I was approaching Riverside Drive on 156th Street, some boys attacked me with stockings filled with chalk, but I was saved by my brother. The area on Broadway was busy, with all kinds of shops, cheese, meat, groceries, cleaner, and further uptown was the Audubon Theater, where they had vaudeville, and then movies. I think the area was considered quite affluent. My family moved into the Riviera in 1959, when I was already in high school. I lived with my parents and my sister in 5E, a four-bedroom apartment, for which we paid $125 per month. Because I was only there a few years before I left for college, I don't have very detailed memories about life in the building although the “drying room” on the roof continues to appear from time to time in my dreams. It was a large interior space on the roof in which laundry was hung to dry. My sister, Nora, who is a few years younger than I am, and I both remember a particularly handsome doorman, though neither of us can remember his name. We also remember that there was a rent strike in which my parents were active organizers. My sister remembers what a great place the Riviera was to baby sit because it was such a large building with so many children living in it. Both my sister and I remember clearly how much Broadway served as a clear dividing line between the mostly white middle and lower-middle-class white families who lived to the west of Broadway, and the mostly African American and Hispanic families that lived east of Broadway. It seemed as if the two communities rarely intersected. My sister remembers that the shopping along Broadway seemed to cater to the Jewish families that lived in the area. I have wonderful memories of the “old neighborhood” and the way the Riviera looked, with manually operated elevators by elevator men, before the postal system installed mail boxes, and when there was a vestibule located between the main stairwells in the lobby, equipped with a telephone switchboard and the old patch bays. And how could I ever forget the wrought iron doors? They were so heavy that I once nearly froze trying to open the middle door during a major snow blizzard as a youngster. The concrete walls on 156th Street and south of the middle entrance were the best in the neighborhood for Chinese handball and Johnny Rides the Pony! The neighborhood was a natural for various stickball and curb-ball games! On hot summer days, we could hear the jingling of the Good Humor ice cream truck bells coming from blocks away! The ice cream man, Eddie, would park in front of the middle entrance and entertain the kids with all types of rubber-ball tricks. A pink Spaulding cost 10 cents! A ride of the subway was 15 cents (usually the price of a slice of pizza was in keeping with subway fares.) As a curious youngster, I must have explored every crevice of the old building. The basements, the locker-room, the tool shed, the laundry room on the roof, and I even managed to climb onto several water towers. Throughout my teenage years (1960’s) I had aspired to become a musician. Many well-known people in the entertainment industry resided in 790 at that time. Lou Gilbert was an actor who was credited with roles in The Great White Hope and Marathon Man. Larry Marshal played Cab Calloway in the movie, Cotton Club. Mr. Wells, who lived on the eighth floor (I think 8M southwest-corner apartment), was the proprietor of Harlem’s famous Wells’ Restaurant. Mr. Wells told us stories about Count Basie and some of the famous jazz musicians who performed at his club. I worked with Joey Dee and the Starliters of Peppermint Twist fame. Joey used to visit me here at 790. He lived with his ailing mother in Lodi, New Jersey, and drove a 1965 gray Cadillac Coup De Ville. While working with Joey, the Bennetts, of Ronnettes fame, moved into an apartment on the tenth floor. We affectionately called Mrs. Bennett Bea. 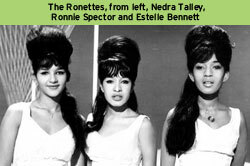 Ronnie Spector and Estelle Bennett lived with their mom and later, during her tumultuous relationship with the record producer, Phil Spector. Ronnie frequently visited 790. 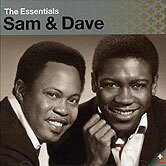 I also worked with Sam & Dave of “Hold On, I’m Coming,” “Soul Man,” “Something Wrong with My Baby,” fame. The band, all 12 pieces, including the horn section, would rehearse occasionally in my apartment. A kid from Visual Arts came by frequently to hear the band(s) play. We called him Freddie Prutzel. He later appeared on Johnnie Carson’s Tonight Show and then starred as Freddie Prinz on the TV sitcom series, Chico and the Man. Sam Moore (of Sam & Dave) often came by to listen to his band, professionally known as the Fantastic Soul Men.